There's more to the humble battery than meets the eye. We recently discussed battery performance as developed by Elon musk et. al. as the coming thing, but there are many means of storing electrical power - most of which have been in use for a very long time. Before the 1920s and 30s, the electrical grid was available only in metropolitan areas, and only parts of those places; the general electrification of the hinterlands was mostly undertaken after World War II. Yet the benefits of electricity were obvious to all, even, or perhaps especially, in locations where line power was not available. In such locations electrical storage devices – batteries – were the only means of getting electrical power unless the use was great enough for a portable generator. We may think of “batteries” as being just one thing, but there are actually many different storage categories and battery types. Solid State Batteries – a range of electrochemical storage solutions, including advanced chemistry batteries and capacitors. What we are used to calling a “battery” is included in this classification. Flow Batteries – Batteries where the energy is stored directly in the electrolyte solution for longer cycle life, and quick response times. These are the types that we use in most of our cars, and although they seem to be fairly similar to our household batteries, they are chemically quite different. Flywheels – Mechanical devices that harness rotational energy to deliver instantaneous electricity - no chemistry involved, just highly advanced materials science so they don't explosively fly apart. Compressed Air Energy Storage – Utilizing compressed air to create a potent energy reserve. Somewhat like flywheels except without the moving parts, these are also the product of advanced materials science to safely store and release high pressures. Thermal – Capturing heat and cold to create energy on demand. The same principle can be used to produce electricity, as with geothermal power plants in volcanic regions, but it can be used to store energy by creating reservoirs of temperature. Your hot-water tank is an example - it uses electricity to create hot water, and that heat energy is still available (for a while) even if your electricity is turned off. Pumped Hydro-power – Creating large-scale reservoirs of energy with water. Hydroelectric lakes are an example of this type. Mostly, the energy generated at dams is provided by the water cycle in the natural environment, but there are examples of artificial lakes which water is pumped up into using surplus electricity, only to let it run back down and generate electricity when there’s a shortage. Of this list, the first, Solid State Batteries, are very much the most familiar; and even this classification consists of two types, primary and secondary. Primary batteries are the type that are referred to frequently as flashlight batteries. They are the ones most commonly used; they are not rechargeable, and they are disposable. The energy in a primary battery is available because of the way that materials are combined to make the battery - that is, the combination of chemicals inside it - and it can be used right out of the package it comes in with no need to charge. The electricity in primary batteries is the result of a chemical reaction, though, and once all the chemicals inside have completed their reaction, there is no energy remaining. Nor is there an efficient way to reverse the reaction and store up more electricity, so we generally throw them in the trash, despite some of the chemicals being pretty nasty and not the sort of thing you want in the environment. Batteries that can be recharged are known as secondary - and indeed, they must be charged, although frequently the batteries come already charged in their original packaging. Nothing lasts forever, and even if not used, both primary and secondary batteries will slowly lose their charge over time. Sometimes "new" batteries may have been sitting on a shelf somewhere for a long time, and consequently are not up to full charge when they are taken from the package. Everybody wants batteries that they can just use without having to think about it, but when it comes to rechargeable batteries, a little bit of knowledge can go a long way. There are a number of reasons not to give rechargeable batteries a partial charge, but to allow them to be used until they are fully depleted before charging them for the first time. If this is not done, sometimes the battery will charge apparently normally, but will not charge to its full capacity. Certain newer types of rechargeable batteries claim to have solved this problem, but it is something to watch out for. There are cheap battery testers on the market that can reveal a rechargeable battery’s state of charge and suggest whether it's time to recharge yet. To the left is a cutaway section through a typical battery, primary or secondary: the familiar flashlight battery, D or C cell. At the top, labeled positive connection, is the button-top of the battery, the anode. The cathode or negative part is all of that stuff in the center of the battery connected to a conductive plate at the bottom of the cell. Thus, batteries can be placed anode to cathode as in a flashlight with multiple batteries to add the voltages. In use, primary and secondary batteries are easily confused. They are designed to look similar to one another and to be interchangeable. Non-rechargeable and rechargeable batteries are frequently mixed in use; it can be annoying to discover you've accidentally thrown away expensive rechargeable batteries along with cheap non-rechargeable ones. 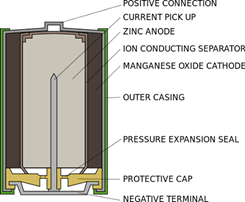 All batteries have those parts shown in the diagram; the anode and the cathode are separated by the chemical means of producing or storing the energy. Most commonly the resulting voltage is 1.5 V regardless of the size of the battery, whether it’s D, C, AA, AAA or some other common size. The small 9 V cells used in many applications are simply six 1.5 V cells grouped together in electrical series, which adds the voltages, resulting in 9 V. There are button type flat batteries used in compact circuits, which are also 1.5 V. And camera batteries and other similar small batteries are 1.5 V too. There are exceptions: this writer at one time owned an electronic flash unit that ran off a 240 V battery. It was very large, about 6”X 4”X2”, and was quite heavy. 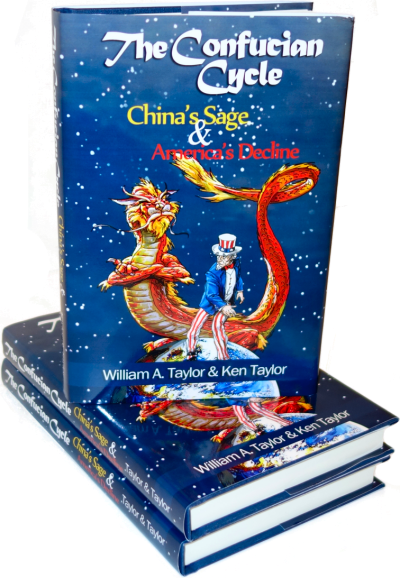 It was also very expensive – forty or so dollars in the 1970s, which at the time was a lot of money. But it was very resilient and lasted a good while, giving consistent, reliable flashes with very small warm-up times. That battery was probably composed of many individual cells, arranged in series electrically. That is the biggest problem with batteries: the individual cells are low voltage, usually 1.5 V per cell. To develop 240 V, the battery that powered my flash would have had 160 cells at 1.5 V each. It probably was constructed in a way that used that many cells bonded to one another and covered with an outer layer of cardboard. Elon Musk’s gargantuan battery, the subject of our article last month, was so big that it must have been an absolute nightmare to wire. It is the largest rechargeable battery ever made, and can power 30,000 houses or so - no risk of it getting thrown away by mistake! It doesn't produce electricity - it stores electricity from wind power - but since the wind isn't on all the time, the combination may prove to be a useful one, and if Musk has his way, we'll soon be seeing many more.